Dear Friends, as the Diwali is coming we know you must be busy in Diwali preparation. And why not? because Diwali is the much awaited festival for Indians in India and throughout the world. Diwali is a festival of lights, and it is celebrated with lots of joy and enthusiasm. 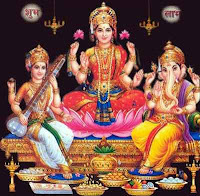 We are writing this post just to help you in preparations of Diwali. 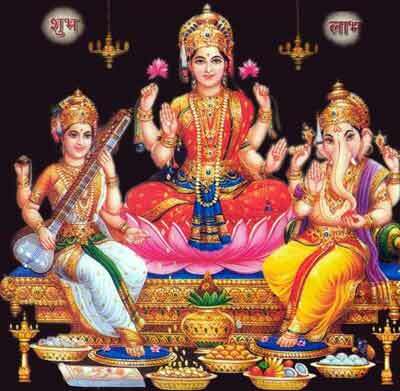 We earlier published many post regarding Diwali and its preparations. Therefore, this post is a attempt to provide you all our Diwali related posts in one place. If you are looking for a Diwali Recepies, we can help you. We can also assist you in Diwali Thali Decoration, Rangoli making, Rangoli Designs, Diwali Candles, Diwali Diyas and Diwali gifts. Home Decoration for Diwali is very important as it is said that well decorated home attracts prosperity. Everyone celebrates Diwali in his own style, here are some Tips to celebrated Diwali in a unique way. We have two week Diwali planner just for you, there are some more ideas regarding Diwali Thali Decoration, Rangoli Designs and ideas to light up your home. And in the we would like to wish you a Very Happy, Safe and Green Diwali. Holi marks the triumph of goodness over evil and so everyone comes together to celebrate this festival of colors with great zest. Family and friends get together to revel in the fun and excitement of this colorful festival. They exchange gifts, sweets, smoother gulal on each other and have a great time together. Presenting pleasant gifts to our kith and kin makes them feel special. You can come up with pretty and heart warming Holi gifts ideas that would put a smile on the faces of your dear ones by just spending some of your time and money. 1. Whatever you plan to present to your dear ones should actually impress them. It need not be an expensive gift but still nice. 2. It is always better to present something that can be of some use to the receiver. 3. Keep in mind their likes and dislikes. 4. You may even be creative and present something hand-made. From presenting a hand knit sweater to homemade sweet meats, from idols to wall hangings… the options to choose are many. Hand made gifts not only seem pleasing but also are very economical. 5. It is also very important to keep a budget. 5. 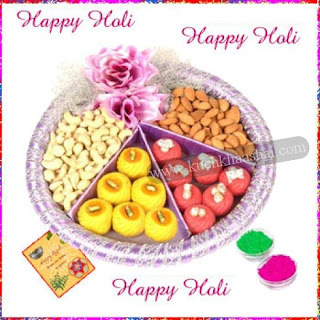 Holi gulal packs, among others. Looking for Holi Gifts for your dear ones can be great fun. 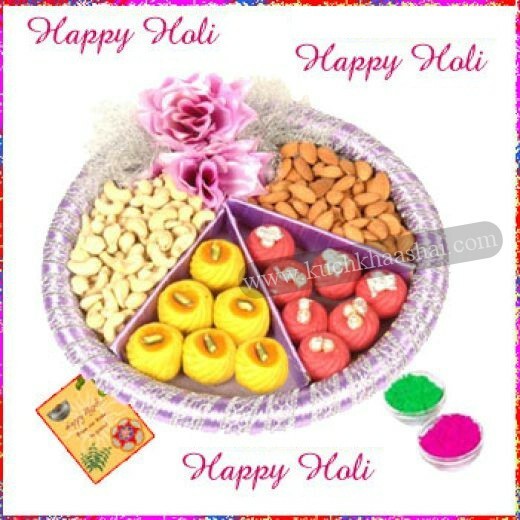 You also have the option of browsing through the Internet and choosing among the many Holi Gift ideas and Holi Gifts that are available on special offers.